Creating art is a very cerebral process for me. Somehow I cannot take the left brain completely out of this right brained and creative activity. I’m also a treasure hunter, so I love popping little surprises into my pieces on occasion. In the world of software or application development, a surprise element is called an “easter egg”. “Dressing Mondrian” whose title is a play on words, was designed with two “Easter eggs” in place. 1) a needle and thread in the shape of Piet Mondrian's younger life mustache (in his younger years, more playful). Yves Saint Laurent was the designer of the Mondrian dress / collection in 1965. 2)The YSL abstractly in the same box. The journey to create seems to evolve in it’s own way - sometimes inspired at different levels. This piece was created as much in my head as it was through inspiration. No matter what, always an interesting process. “Dressing Mondrian” featuring the YSL classic Mondrian Dress. The YSL - just a small homage to the original designer. 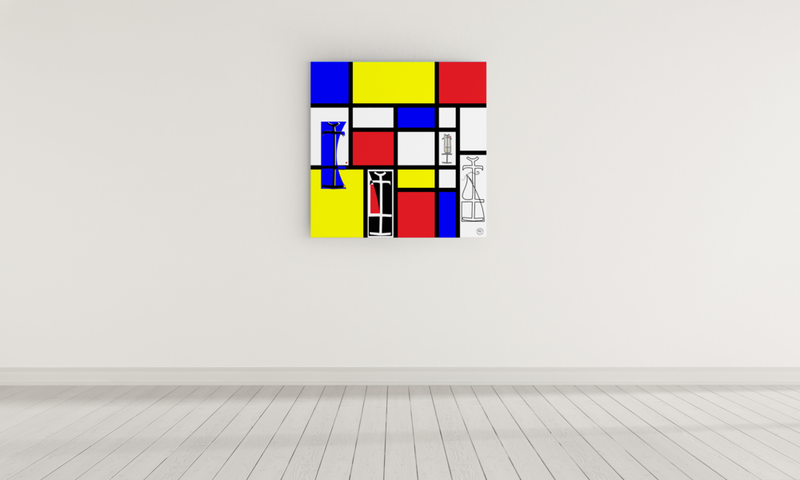 48”x48” “Dressing Mondrian” on canvas. If you are interested in this piece, or any other, feel free to contact me directly at TheRedDotArtist@gmail.com .